On Saturday afternoon Florida Gulf Coast University beat Mercer in the Atlantic Sun conference tourney title game and became the first team this year to earn an automatic bid to next week’s NCAA tournament. The Eagles lost the 2012 A-Sun championship game, but bounced back in 2013 to claim the 1st NCAA tourney bid in school history. Earlier today Jon Teitel got to speak with conference Defensive Player of the Year Bernard Thompson, All-Conference 2nd-team member Chase Fieler, and Coach Andy Enfield about what it feels like to make the tourney for the 1st time. You scored a game-high 21 points in a November loss to VCU (led by Briante Weber’s 13 points, 10 steals in only 18 minutes): are the Rams the most amazing defensive team that you have ever seen? By far: they pressured us for 40 minutes straight and had great anticipation. Even when they put their bench players in they did not lose any intensity. You had 13 points and four steals in a win over Miami in November (the first sellout in school history). How were you able to beat one of the best teams in the country? We played solid on both ends of the floor and tried to attack their big men to get them in foul trouble. We tried more of a run-and-gun game. You scored a career-high 24 points in a loss to Duke in November (thanks to a 30-0 run by the Blue Devils). Do you think they are the best team in the country? They are a good team with a great coach: if not the best, then they are in the top three. You set a school-record with 88 steals this season and were named conference defensive player of the year. What is your secret for playing great defense? I just try to have great anticipation and be in the right spot at the right time. Coach preaches for us to play defense with great pride. You beat Mercer in the conference tourney title game, becoming the only team to beat them on their home court all year. What did you learn from last year’s title game loss to Belmont that helped you this time around? Last year our bodies were a little weak so we came in this year more physically fit. We also played smarter and focused on playing as a team for the whole 40 minutes without letting up. Sherwood Brown led your team in scoring and rebounding, had a double-double in the win over Mercer, and was named conference player of the year. What makes him such a great player? He has a great all-around game and can go into the post even as a guard due to his size. Whenever he does something well it gives us plenty of energy and momentum. You won all three of your conference tourney games by double-digits and have won 12 of your last 14 overall, do you think your team is playing its best basketball of the season right now? We are: just trying to play as a team and not have any ups and downs. This is your first NCAA tourney bid in school history: what was the reaction like when you got back to campus? I got a round of applause when I came into class and all of my teachers gave me a shout-out. People are shaking my hand and congratulating me, so it feels really good. 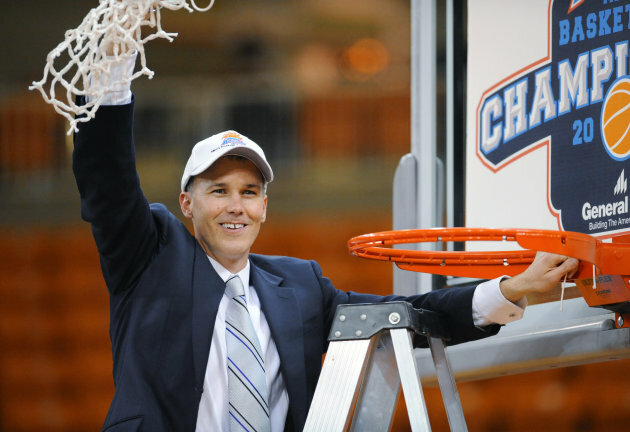 What makes Coach Andy Enfield such a good coach, and what is the most important thing that you ever learned from him? He will be straightforward with you and tell you how it is. He is very smart and puts his trust in us to take the responsibility of just going out and playing. What seed do you think you deserve, and what seed do you think you will get? I do not know to be honest: I am just ready to play whoever we get matched up against. You come from a very athletic family, as both your parents played college sports and your sister plays college volleyball, who is the best athlete in the family? Honestly, my little brother, he is at prep school for football and is 6’6”, 290 pounds and strong as an ox. You had seven turnovers in a November loss to VCU, are the Rams the most amazing defensive team that you have ever seen? They definitely have you of the best trapping defenses I ever saw. It was the first time where I ever turned the ball over and did not know what I should have done. You scored 17 points and made a layup with 1.5 seconds left in a one point overtime win over South Carolina Upstate in January (the Spartans 1st home loss in over a year). Who was the play designed for, and where does that rank among the highlights of your career? It was designed to get a shot for Sherwood, but I ended up getting a great pass underneath. It is in my top-5, as it helped us win a conference game on the road. Bernard Thompson set a school-record with 88 steals this season and was named conference DPOY. What makes him such a great defender? He has lateral quickness and a huge 6’8” wingspan for a guy who is only about 6’2”. He sees things coming before they happen. Even back in the preseason we knew that we had to work harder and get in better shape. We are more mature and mentally prepared this year. Sherwood Brown led your team in scoring/rebounding, had a double-double in the win over Mercer, and was named conference POY. What makes him such a great player? He has an unbelievable motor and plays harder than anyone else I have ever played with. You won all three of your conference tourney games by double-digits and have won 12 of your last 14 overall. Do you think your team is playing its best basketball of the season right now? We definitely are peaking at the right time and are on a roll. This is your 1st NCAA tourney bid in school history, what was the reaction like when you got back to campus? There is a big buzz around campus and everyone is excited about it: they want to know who we are playing next and when/where the game is so they can make the trip to see us in person. There is nothing specific: he is just so well-rounded and can coach players at any position. Mercer coach Bob Hoffman stated earlier this month that whoever won our conference tourney deserved a #12-seed, but due to a couple of factors I think we will end up with a #13-15 seed. You were one of the best free throw shooters in NCAA history at Johns Hopkins, yet your team shot less than 70% from the line this season. What is your secret to free throw shooting, and how hard is it to teach to players? The secret is similar to that for jump shooting: technique matters the most, and then get as many repetitions as possible to shoot it the same way every time. If I want to be a scratch golfer, I would need to change my grip, swing or follow-through. Confidence stems from seeing the ball go in over and over again. In 1991 you were named NABC Scholar-Athlete of the Year: what importance do you place on academics when it comes to recruiting players? We look at the whole package: on-court talent, off-court personality, academics, etc. They have to be a good fit for our system and with our current players. You served as an assistant to Rick Pitino when he was with the Celtics. What makes him such a great coach, and what is the most important thing you ever learned from him? He is very charismatic and knows how to deal with players. He is a great motivator who taught me how to change your style/mentality in certain situations. He is a great X’s and O’s coach as well and has had a Hall of Fame career. You lost to VCU in November, are they the most amazing defensive team that you have ever seen? They are one of the best: they create turnovers, shoot the gaps, and play the passing lanes. It was a tough environment for our season-opener on the road (VCU has won 87% of their homes games during the past 13 years), but I would love a rematch this month because we are a much better team now. You beat Miami in November (the first sellout in school history). How were you able to beat one of the best teams in the country? We lost to Belmont in the conference tourney title game last March while starting three freshmen and one sophomore. We had a great off-season of player development, so we entered this season with more confidence and better leaders. We defended, rebounded, scored and did the necessary things to beat a top-20 team in the country. I give them a lot of credit for winning the ACC…but we get a lot of credit for beating them! Bernard Thompson set a school-record with 88 steals this season and was named conference DPOY, what makes him such a great defender? He has great anticipation and is a great athlete. He has long arms for a 6’3” guard, he had a steal in practice today on a play where I did not even think he could get close to the ball. Sherwood Brown led your team in scoring/rebounding, had a double-double in the win over Mercer, and was named conference POY. How crucial is he to your team’s success in March? When Sherwood plays at a high level we are an awfully good basketball team. He is the strongest athlete on our team and can bench-press over 300 pounds. We feed off his energy. I sure hope so. If we can play next week the same way that we we played last week, we should be fine. This is your first NCAA tourney bid in school history, what was the reaction like when you got back to campus? This whole community is excited. We have no college football and no pro sports near us, so everyone has embraced our success. We had great crowds during conference play and were 15-1 at home, so to have that kind of support really helped us. We had an extremely tough schedule and have a good RPI and some good wins, so I think we deserve a #13-14 seed. If I had to guess, we will get a #14-seed because people are not familiar with our program…yet.